NYTimes: "Murder by Death," ... is Mr. Simon's fond send-up of the work of Agatha Christie, Dashiell Hammett and Earl Derr Biggers. By bringing Sam Spade into the comparatively genteel worlds of Hercule Poirot, Charlie Chan, Miss Marple and Nick and Nora Charles, Mr. Simon might appear to have mixed his genres with unforgivable lack of respect. Yet his creation, Sam Diamond, hilariously mugged by Peter Falk, is one of the principal joys of the film; he's the rude noise that shakes up the drawing room. Empire: The plot is deliberately absurd, with a last-reel set of revelations that never make sense, and more unmaskings and improbably theories than any five Agatha Christies thrown together. It was successful enough to merit a sort-of sequel, also scripted by Simon, with Falk in a trenchcoat again as The Cheap Detective. thrillingdetective.com: The film's never quite as good as it could be, and is disappointingly uneven, dipping a bit too frequently into the well of toilet humour, and just plain silliness at other times, but the one-liners sure keep on coming. In other words, if you don't like that particular gag, wait a few seconds. A worthwhile way to spend an hour or so, especially if you're a fan of old detective flicks. efilmcritic: It was undoubtedly Simon's intent to poke fun at the expense of crumbling mystery cliches, but his main mistake was to attack the structure at the core of the genre's success -- the quest to solve a crime -- rather than the adaptation of this structure to suit individual writers' style, and although Simon indeed made a few valid points regarding the genre (for example the reader's inability to solve the crime because vital information is withheld), his apparent belief that the only possible way to denounce the situation was to do it through a plot that makes no sense, and that we needed to be reminded of this every now and then, is irritating, to say the least. 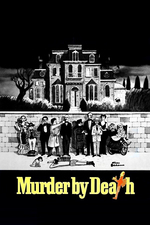 "Murder by Death" adopts an in-your-face, no-holds-barred approach very early in the film, reaches a ceiling not even halfway through it, dies there, and by the time we reach the ending we could very well be in dullsville were it not for the cast and the dialogue. Interest is not sustained; it is discouraged. Nursey shouting "Shooooeeees!" may be the greatest single-word punchline in the history of film. Charles Addams did the titles for this, one my (and my kids, kids love this movie!) favorites. Oh my God. I almost completely forgot my story about this one! So Neil Simon used to rent at the video store I worked at in Westwood, Videotheque. One day he came in, and I asked him if I could ask him a question about Murder by the Death. Sure, he said. Well, I said, I noticed there is a creepy guy in the buses in the Charles Addams poster for the movie, and I can't figure out who it is. Simon got out his glasses and looked. Oh, there's Peter Falk he said. There's Truman. There's David Niven. And he just went down the row, naming the cast members. Then I pointed to the grinning man at the solarium. Who is that? he said. Is it Charles Addams? I asked. Did he sneak himself into the picture. No, Simon said. Addams didn't look like that. Is that somebody from the film. I don't recognize him. I've never noticed him before. He stared a while longer. Good lord, he said. Who is that? I've always thought Clue was rather inexplicably overrated. (Superb cast, running around exchanging a lot of so-so dialogue. It's OK I guess, but I never know what to say when people gasp about how it gave them life.) For me, this movie feels like what Clue was trying to be. I'm not even much of a fan of Neil Simon or the mystery genre, but this thing is just so hilarious and weird. The cast for Murder by Death is even more amazing than Clue's, and they're given terrific dialogue that they all have a ball with. They're all so great, but I think Alec Guinness may be the one who steals the picture. I like Murder by Death by I am a much bigger fan of the Cheap Detective. I'm not a Frenchie, I'm a BELGIE! Saw this in the theater when it came out and actually knew most of the references because I was a weird kid who watched a lot of old B&W films. I loved it at the time and watched it a few years ago and it still holds up well. It's not as good as a film could be with such a stellar cast but fun to see such a young skinny James Cromwell even if it's a little sad to think how few of those great old actors are still around. I read the novelization of the movie long before I eventually saw a VHS copy. I don't remember a lot about the book (though I know I enjoyed it), except that it described the character of Lionel Twain as looking exactly like Truman Capote, which I figured was a joke of some kind even though I didn't understand it. It looks like it had a couple of editions, which surprises me a bit. The original has the tagline: "A bloody funny movie. A funny bloody book." God I need to rewatch this movie. It's absolutely a family favorite.